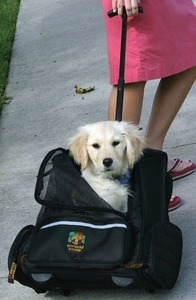 Yesterday I reviewed Outward Hound’s “Roll Along Pet Carrier,” and today I have the pleasure of offering it to a Dog Jaunt reader! The prize carrier looks just like the one in the photo, minus the (surprisingly large) dog. Many thanks to The Kyjen Company for sponsoring this giveaway. Using the form below, please tell me about a favorite dog-friendly place — a park, hotel, shop, or restaurant that you and your dog have enjoyed together. You may enter once per day. If you subscribe to Dog Jaunt or follow @dogjaunt on Twitter, you will get additional chances to win. Subscribers, please insert the secret code at the bottom of each post and type it into the form. Twitter followers, please type in your Twitter name. Please include your email address in the comment form (your email isn’t shared with anyone, and I will not send you email unless you win). Please submit your entries before 11:59 pm (Eastern time) on Wednesday, Feb. 3. We will choose a winner randomly, and the results will be announced in a post here on Dog Jaunt on Thursday, Feb. 4. To enter, you must be a U.S. resident, age 18 or older. Only one comment per person per giveaway post. Duplicate comments and anonymous comments will be discarded. Please make sure that the email address in your comment form is valid (email addresses are never public). Winners must claim their prize within three business days after the date of notification of such prize. A winner’s failure to respond to the prize notification within the specified three business days will be considered a forfeiture of the prize and an alternate winner may be selected from the pool of eligible entries. If an entrant is found to be ineligible, an alternate winner may also be selected from the pool of eligible entries. We will disqualify any entries that we believe are generated by scripts and other automated technology. Winners shall be responsible and liable for all federal, state and local taxes on the value of their prize. Employees, partners and vendors of Dog Jaunt and their immediate family members are not eligible to enter.